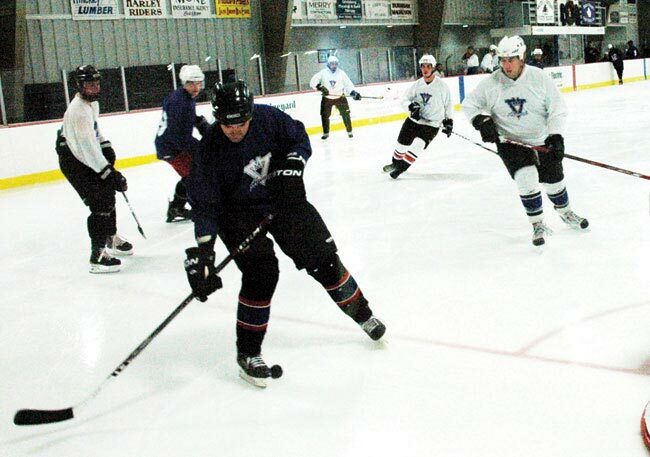 The Purples defeated the Whites in the 13th annual Ryan Mone Memorial Alumni hockey game at the MV Arena, Friday, 7-3. Twenty-nine men were listed on the game program and so far as we could tell, they all showed up to play two twenty-five minute halves, running time. Joe Merry was first to score for Purple, assisted by Aaron Robinson and Brooks Billingham. Brandon Willett made it 2-0 with help from Bill Briggs. Jerome Rogers’ goal, assisted by Merry and Billingham, gave the Purple a 3-0 advantage and Steve McCormack, aided by Merry and Teddy Kramm put the Purple up 5-0 at the half. The White team posted its first goal early in the second period as Tad Gold scored unassisted. Purple got it back with a counter by Jock Cooperrider, assisted by Kramm, then upped the lead to 7-1 with a goal by Geoghan Coogan, set up by Kramm. The last two goals were colored White. Alex Avakian scored assisted by Gary Ben David, the game’s most senior citizen, and by Josh Naylor. The final score of the game was by Michael Giordano from Antone Silva and Cody Pachico. Jon Mone and Bill Briggs skated well for Team White. Purple goalie Eli Bonnell was probably the game’s MVP. In the Alumnae game, there was a lot of good skating but little scoring by the 13 uniformed ladies. The White’s prevailed, shutting out the Purple, 2-0. Impressive work by Angela Bettencourt, Cristina Wiley and Jen Gauley Woods, kept the fans buzzing. The low score was largely attributed to outstanding work in goal by Elise Bonnell and Jaime Forend. Over at the Sancy, the Island’s basketball alums took on the Vineyard varsity teams. In the women’s contest, former standout Jess Wilcoxson led the MV alumnae to a five-point victory. The men’s game was a different story, however. The Vineyard varsity had a little more get up and go in the latter stages and prevailed, 88-73, over the elder hoopsters.